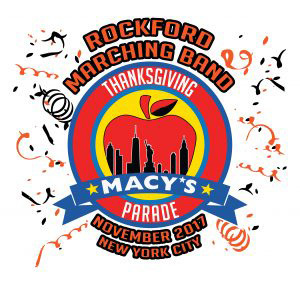 Tag Archive | "Rockford Marching Band"
The Rockford High School Marching Band has been chosen as one of ten music programs to perform at the nationally televised 2017 Macy’s Thanksgiving Day Parade in New York City on Thursday, November 23. Rockford High School Marching Band completed a rigorous two-year application process in order to perform at the 2017 Macy’s Thanksgiving Day Parade. The application process included extensive screenings and review of letter of recommendations, resumes, and video footage. Rockford HS Marching Band was chosen from a field of over 200 of the best high school, college, military and specialty bands across the country. Since the conception of the Macy’s Parade in 1924, they are the first West Michigan High School Marching Band and third in the State of Michigan to have the honor to perform. The 350-member music program, under the direction of Brian Phillips, is asking the community to assist in multiple fundraising efforts to aid their March to Macy’s. The band is looking to raise $500,000 for the trip. The Cedar Springs community has a chance to help raise funds for the Rockford band on Tuesday, July 25, when Cedar Springs Brewing Company will hold a community giveback night. Between 4-9 p.m. they will donate 10 percent of all food sales to the Rockford Marching Band. If you’d like to donate directly or find other events to participate in, visit http://www.rockfordbands.org/wp/.